The lack of rifts and fractures, and the presence of bulges produced from lava accumulation over many geological époques lead us to think that Venus does not have planet-scale tectonics. 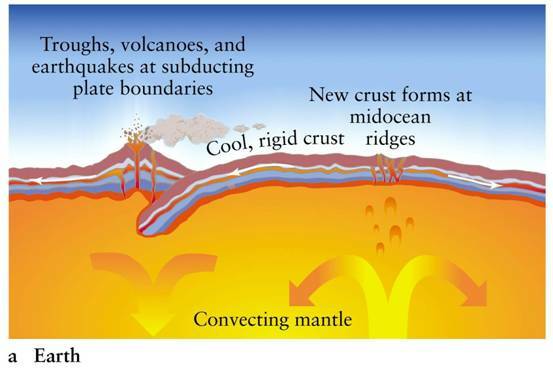 The volcanoes seem immobile and are not aligned in chains over subduction zones or ridges as on Earth. This is perhaps a sign that the crust of Venus, subject to extreme temperatures and pressures, is more deformable than that of the Earth, easier to re-model than to recycle, especially since the crust contains very little water. The rocks on Venus that were analysed by the Venera probes were made up of silicates, nickel and iron. Venus’ surface structures were formed by vertical movements due to fused rocks rising from the centre of the planet. When these balls of hot rock apply pressure to the surface, they can form domes or crowns. When these rocks break the surface, they create volcanoes. Nowadays the evacuation of the internal heat of Venus depends only on these hot points. They are perhaps not sufficient to complete the task, such that the planet goes through periods of overheating, when volcanism restarts. The last of these episodes happened about 500 millions years ago. Comparison between the tectonics of the Earth and Venus.